The fuel management unit is designed for use on multi-point electronic fuel injected engines. It is a secondary fuel regulator that installs in series with a stock regulator on the return line to the tank. The unit increases fuel pressure in proportion to boost pressure (this assumes the pump being utilized is of sufficient pressure and flow to deliver the fuel required). This is great for cars going boost on a low budget or have a lack of engine management support via ECU retuning. Because it is a mechanical based unit, no special electronics are needed to run this unit. It is very straight forward to install. 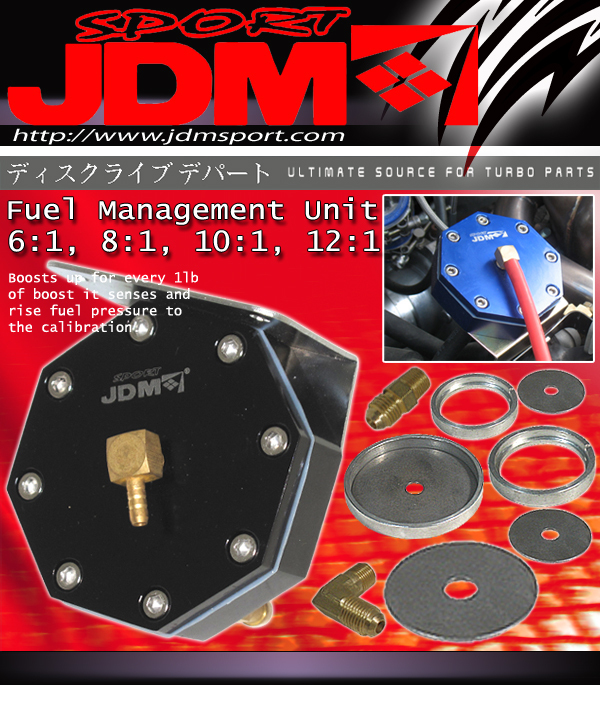 All JDM Sport fuel management units are CNC machined from 6061-T6 aluminum.